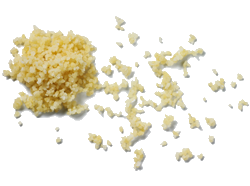 Granules made from steamed and dried durum wheat semolina, couscous has become a popular alternative to rice and pasta. It has a light fluffy texture which is a little bland in flavor but readily soaks up the flavors of other ingredients. Couscous originates from North Africa, and is the staple ingredient in the North African diet. 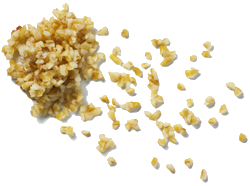 Bulgur is used in Middle Eastern, North African and Eastern European cookery, where the bulgur is added to soups, rissoles and stuffed vegetables. 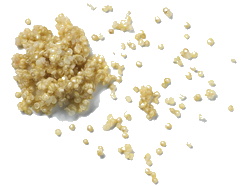 Bulgur is a quick-cooking form of whole wheat that has been cleaned, parboiled, dried and graded into particles. These wheat particles have a delicious, mildly nutty flavour. 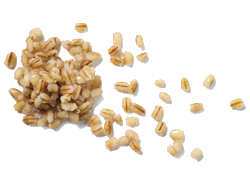 Ebrofrost produces a large range of whole grain products from wheat, barley, oats to organic spelt. In collaboration with our customers we are able to find the right grain to create a great base for your new and innovative meal. The lentil plant (Lens Culinaris) originates from Asia and North Africa and is one of our oldest sources of food. The brown lentil is ideal for warm salads, casseroles and stuffing as they tend to retain their shape after cooking. 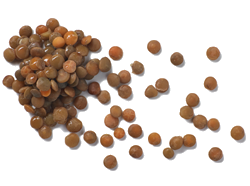 Ebrofrost is able to produce a broad range of lentils going from brown, green to Beluga lentils.